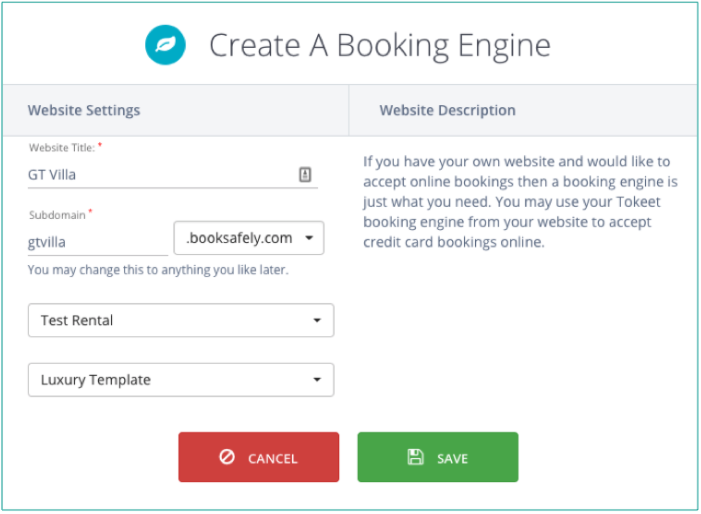 Tokeet booking engines can power a booking widget you implement on your non-Tokeet website, or you can link directly to booking engine pages from your site. 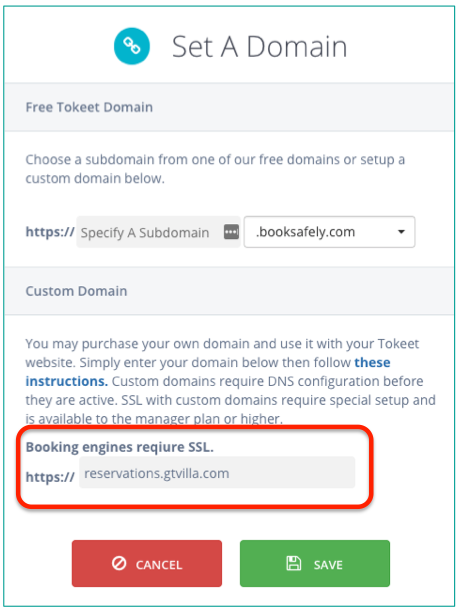 You can utilize Tokeet's booking engine domains like booksafely.com, or utilize your own domain by following a few simple configuration changes in the second part of this article. Before you create a booking engine, make sure to add the Stripe Payment Gateway. On the subsequent Booking Engine Details page, select the Rate Category used by your Booking Engine. That's it! Your booking engine is now live and can be used in a Tokeet booking widget. Now, click "Configure" to enter in your custom booking engine domain. On the subsequent page, delete the Tokeet subdomain and enter in your custom domain name. You must now make a few DNS changes to point your website to the Tokeet booking engine. Log into your domain registrar's website and locate the DNS (Domain Name System) settings for your domain. Create or update your A record to point to 34.207.48.246 . Note that Tokeet will redirect any request for your-domain.com to www.your-domain.com. If you're using a subdomain, e.g. something.your-domain.com, and not a top level domain, then you can skip the A record configuration. Tokeet must now issue you an SSL certificate. Please contact us through chat or at support@tokeet.com and request the SSL certificate for your custom domain booking engine. You will receive an email from Amazon with a request to approve secure certificates for your domain.